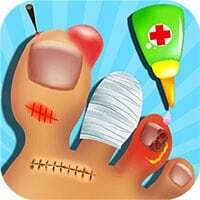 Become a Nail Doctor in few steps in gaming world. Nail Surgery is an innovative concept as of today. Our mission is to make awesome educational games for kids. Using an interactive, first-hand virtual surgery experience. Everyone knows that medicine and surgery. Are bit of boring and weird topic. But we believe that our visitors need an enjoyable. Goal-oriented interactive experience. To fully grasp the complex or unfamiliar concepts of surgery. This game can be played on all devices. It is one of the educational games at Round Games. Enjoy and have fun in playing this game. Nail Doctor is a free online game on RoundGames.